JEFFERSON CITY, Mo. – A proposed initiative to bring ethics reform to Missouri has gained support from the League of Women Voters in Missouri, despite two legal challenges being brought against the proposed legislative reform. Amendment 1, better known as the Clean Missouri initiative, was certified by the Secretary of State’s office in early August to appear on the Nov. 6 ballot. The legislative reform amendment seeks to lower the campaign contribution limits for the state’s legislative candidates, eliminate nearly all lobbyist gifts to state lawmakers, impose a two-year cooling off period on lawmakers seeking to become lobbyists after serving, and would require a nonpartisan expert to draw legislative district maps which would then be reviewed by a citizen commission to ensure fairness and competitiveness. The provision that has proven to be the most contentious is that regarding how Missouri’s legislative maps are drawn, with one lawsuit asking a Cole County judge to toss the initiative off the ballot. But a second lawsuit was filed by Lowell Pearson on behalf of the Missouri Chamber of Commerce and Industry, arguing that another provision of Clean Missouri, which would ban political fundraising on state property, violates First Amendment rights. “The ban would include, at a minimum every conservation area, state park, state building, state monument, piece of state university property, state-owned or controlled road, state parking lots, and countless other areas that have nothing to do with the legislature,” the lawsuit says. Both cases look primed to hit the fast track, with the clock ticking away before the November election. 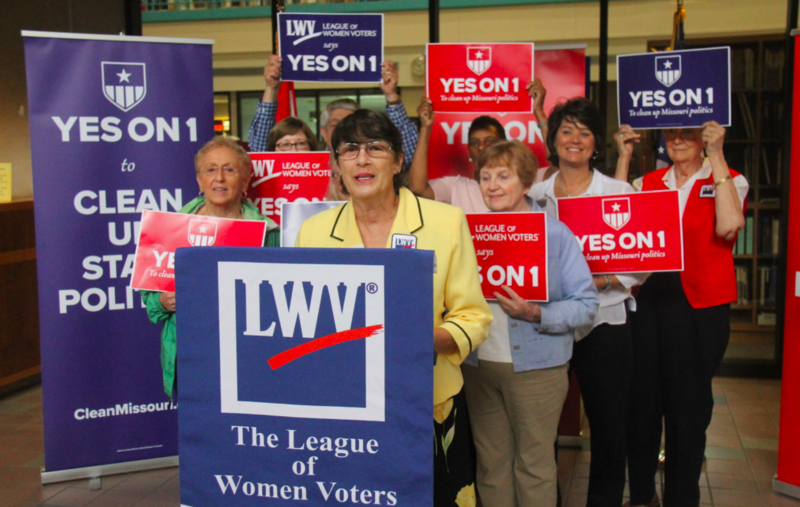 Despite those legal challenges, the LWV endorsed Clean Missouri on Wednesday morning, saying that it was necessary to clean up state politics. The organization’s news conference, held in the lobby of the Secretary of State’s office building, was the first of several news conferences across the state this week to share their reasons to support the bipartisan ballot initiative. She said that records show lobbyists are spending nearly $900,000 every year in gifts to Missouri legislators and said that in many cases, they don’t know which committee members receive those gifts and meals, which she said wasn’t right. As for the issue of redistricting, Boswell said it ensures no party is given an unfair advantage, a point that League board member Marilyn McLeod reiterated.